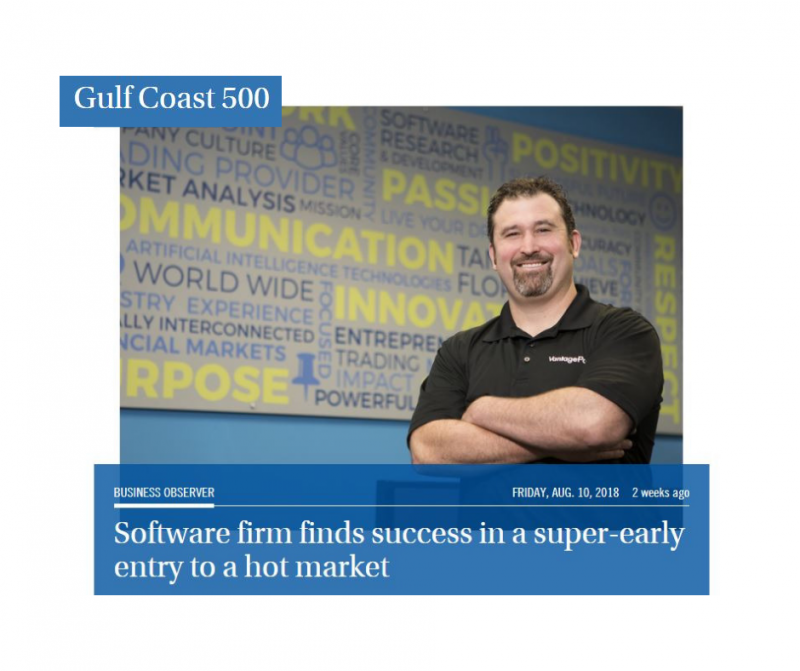 Wesley Chapel, Fla, September 6th, 2018 –Market Technologies, the developer of VantagePoint and the first company in the world to bring artificial intelligence (AI) forecasting capabilities to the retail trader and investor, has been included on the Business Observer 2018 Top 500 list. Market Technologies is proud to have made the list due to their revenue achievements, but according to company President, Lane Mendelsohn, it’s not just about the revenue for them and is more about the many lives they are changing daily. In addition to helping traders and investors to make profitable trading decisions, VantagePoint helps better the lives of those in the community by making continuous financial contributions to organizations such as Shriners Hospitals for Children. In fact, a large portion of the company’s revenue either goes right back into Research & Development to build an even stronger software for customers, back into the local community, or to provide benefits to its employees such as 100% company provided healthcare. Today, VantagePoint has over 30,000 customers in 140 countries across the globe and will be celebrating its 40th anniversary this coming year. For a free demo of the software, visit: https://www.vantagepointsoftware.com/demo/ or call 800-732-5407.